Outstanding Office/Home complex! 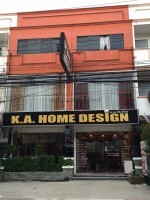 Located only a short distance from the main Sukhumvit Highway on the very busy Chaiyapruk 2 Road is this high standard 2 shop house office building. It also has a 2 level owners flat with 2 full en-suite bedrooms!! The units have been renovated to a very high standard and offer great value for money for those wishing for a prime location office but quality accommodation as well. This place has no comparison in the area. The main office is on the ground floor but also further offices on the 2nd and 3rd floors. The owners apartment is split over the 2nd and 3rd floors and has a very spacious living area, full European kitchen, utility area, 2 large bedrooms and comes partially furnished. The premises are held in Thai name and taxes and transfer costs will be split 50/50. Living area : 425 sqm.